The DuoFlex pads are designed for the Rekola Reflex DuoFlex tool. The DuoFlex pad is available in 3 different types – AbrasiveSoft for tough cleaning, Glass and Mirror, and Mesh for general cleaning – glass, mirrors, tables, desks, monitors, flat surfaces – DuoFlex pads will do the job. With just one squirt per square meter onto the pad or directly on to the surface the DuoFlex with Ultra-Microfiber finished the job. When one side of the pad is dirty, flip it over and you have a clean side. When both sides are dirty simply remove the pad and wash at 60 degrees. The Ultra-Microfiber cloth makes manual cleaning of surfaces easier due to the cleaning friction against the surface and without additional pressure through the tool. Hard top, ceramic, chrome and glass surfaces for best hygienic cleaning results. Suitable for cleaning toilets, baths, showers and sink facilities in healthcare, nurseries, schools, universities, offices, public buildings, food industry, hospitality and residential areas. Also suitable for use in sports facilities for cleaning locker rooms. 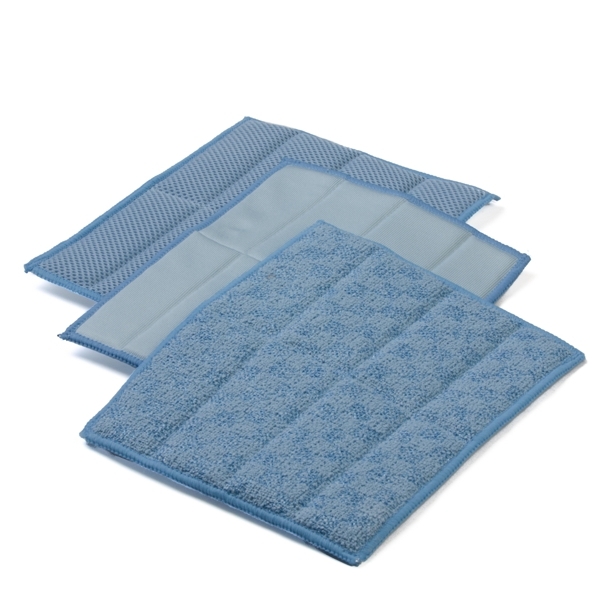 Use as an alternative to microfiber hand cloths. 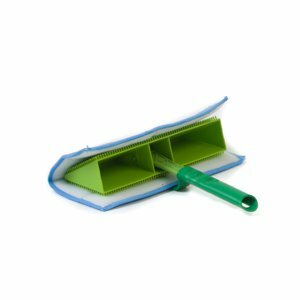 Used in conjunction with Rekola Reflex DuoFlex hand tool, apply the Velcro loop side to the hooked surface of the hand tool. Apply water/cleaning solution on to the pad or directly onto the surface to be cleaned or use the DuoFlex pad dry. If using spray bottles we advise to use the jet spray setting. Alternatively charge pads in a washing machine, by adapting the final spin cycle. Depending on surface circumstances, charge the pads with 5-10 ml per pad. Non–bleach disinfectant* laundry agent and autoclaving may be used if required *e.g. peroxide based; this may affect colors. 500 washing cycles. Rough abrasive surfaces and intensive rubbing of open structures like drains may reduce lifetime expectations. Ultra-Microfiber, F= 0,154 Dtex, 80% PES 20% PA.